Most folks agree that effective processes and tools are needed to govern the stages, assignments and ultimately the output of your project. They are truly critical to the success of every endeavor. This includes setting and tracking goals, compiling and organizing important project assets, and managing the day-to-day workflow of both client and agency team members. Timelines, tasks, important milestones and due dates are what come to mind for most people when discussing project management. There's no doubt these items are important and must be considered and tracked effectively, but I'd argue they are not the most important aspects of any project really. In a way, these are the simplest elements of every project. I've found that it's the more intangible items that have the most impact, up or down, on both the project success and the relationship between our team and yours. Let's define the intangible here. It's the communication between the milestones, the emails, the scheduled calls and the ad-hoc calls. It's in the way information is collected, organized and shared with team members. It's also the struggles and speed bumps we hit along the way, most of which is traditionally hidden from the Client team versus shared openly and honestly... for fear of negatively impacting the confidence in, or competency of the Agency team. These items come with many challenges. When critical details are shared over the phone, things are easily misunderstood. Minor misunderstandings today typically evolve into an irritating and costly course correction down the road. And there's also a little issue of onus probandi. It's important in business to have a record of critical communications and agreements, and barring recording these sort of conversations, this is simply impossible to do over the phone. When project communications and updates are sent via email, inevitably some folks are left off the string, creating misalignment and confusion across team members working on the same task. And when that information needs to be reviewed later down the line, a search via email becomes a frustrating and ineffective process. Was that email titled "Our Customers," "Audience Profiles" or "Take a look at this when you can" – your guess is a good as mine. Don't misunderstand, we've tried just about everything that anyone thought would work to accommodate the above activities. Sending recap digests after every call, syncing emails into the PMS, and even copying and pasting emails at one point, just for the record. And more, so much more. None of these efforts truly solved the problem, there were still too many cracks. But what it did accomplish is inflating the PM hours required to deliver for our clients beyond what is acceptable to any of us. And we've tried just about every Project Management Solution you've heard of, including Harvest, Basecamp, Daylight, Workamajig, To Do, Google Tasks, and others. Most of which still take a straight PMS approach, with a cool UI and a few bells and whistles for sure. But in each case, we found that our Clients were still compelled to use email regularly, send disparate documents, and still require numerous phone calls to make sure we're on the same page. Our team felt that this should not, and could not, be the bar here. Finally, we found Asana. 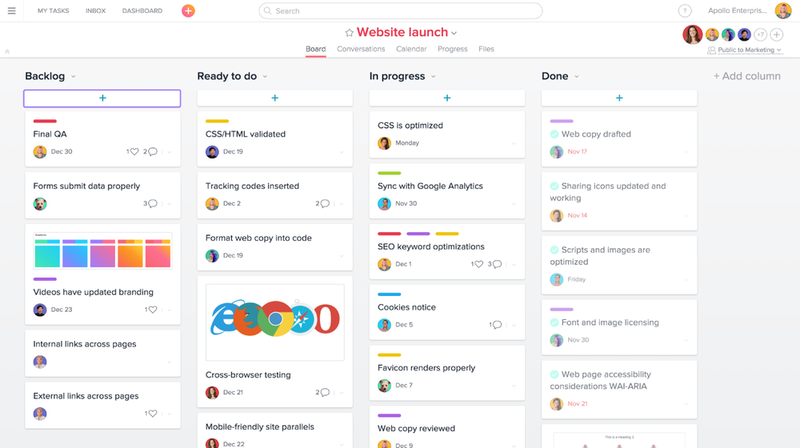 Created by Dustin Moskovitz, co-founder of Facebook, and ex-Google-and-Facebook engineer Justin Rosenstein, Asana is a project management solution like many others. It includes those tried and true features that are damn near critical for every single project. Task management available in a waterfall or kanban layout, of which we use both; Gantt Timeline and Calendar views for our more marketing-minded folks. It has document management and reporting features, and integrates with other tools like Slack and Harvest. But you really don't need those additional integrations if you figure out what Asana is all about and go all in. The critical difference is that Asana at its very core was designed to improve team collaboration. And this is most evident in the team's approach to communication across the platform. To replace email, there is Conversations. For any communications that are not task specific, you simply jump in, add a subject line and start typing, just as you would in email. There are no extra steps. However, the beneficial difference with Conversations is that you don't need to think about who should be included, as both agency and client team settings have been determined at the beginning of the project. You can always ensure that the correct folks are seeing the communication, they get notified in their Asana inbox and on their mobile devices via push notifications, courtesy of the Asana mobile app. And for those that choose to keep one foot in email, you can receive email notifications as well. All the bases are covered. There is a special section for Status Updates, separate from simple Conversations. It is here that bi-weekly status updates are sent out across all projects to all team members. Updates include color status-indicators to quickly determine if the project is on track, or if something is impeding forward progress. While no one, and I mean no one, ever truly wants to learn a new technology tool, I can assure you that this one is worth the very minimal effort required. It just makes common sense, so it's easy to adopt. Asana provides very helpful information to aid in this education, and our team is always available to answer any and all questions we can for our clients. It's not for everyone, however. If you are someone that prefers the ambiguity of phone calls, likes the disorganization of managing critical communications via email, or perhaps you're just simply stuck in the old way of doing things and don't want to change lanes, then Asana isn't for you. But, and I say this with kindness, neither is Interstellar.